The collections of Vernon I. Cheadle and Katherine Esau span 60 years of botanical research. Dr. Cheadle's research interests focused on the tracheary cells, the water conducting cells, in higher plants. Dr. Cheadle also served as Chancellor of UCSB from 1962-1977. 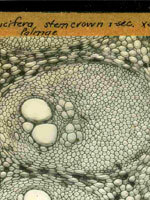 Dr. Esau's successful and prominent career in botany included studies on developmental and pathological plant anatomy and on the ultrastructure of phloem, the food conducting cells in higher plants. She is best known for her beautifully written and classic textbooks on plant anatomy. Over 105 images of both light and electron microscope slides have been digitized so far. You can view them online. Over 5000 bottles of fluid preserved (pickled) plant specimens including monocotyledons, dicotyledons, and a smaller number of conifers and ferns collected in Cuba, Australia, New Zealand, Africa, and the United States comprise the majority of the collection. Approximately 64,000 microscope slides prepared from these specimens compliment and support the preserved collection. Field collection information including photographs, herbarium voucher sheets, tracheary cell measurements, and general anatomical information is contained in the extensive data card files. Additional anatomy collections include a phloem slide collection and supporting data consisting of over 1100 slides jointly prepared by Cheadle and Esau. This collection of beautifully prepared and stained microscope slides represents research conducted at UC Davis during 1950 and 1951 by Cheadle and Esau on the secondary phloem of dicotyledons. Collection information including locality, age of stem samples, preparation procedures, and specific section information are included in data card files. This collection consists of 119 families, representing 342 genera. Additional donated slide collections from Drs. William L. Stern, Norman Boke, Adriance Foster, Maynard Moseley, and others complete the extensive collection.